• Ecosystem structure and functions are determined by the forcing functions of the system. • Energy inputs to the ecosystems and available storage of matter are limited. • Ecosystems are open and dissipative systems. • Attention to limiting factors is strategic and useful in preventing pollution or restoring ecosystems. 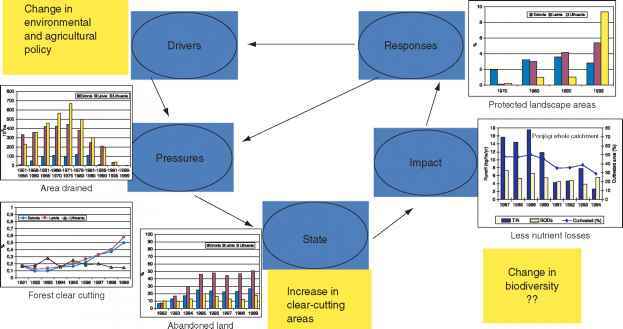 Figure 2 The DPSIR framework for reporting on environmental issues: an example of the change in the political and socioeconomic system in Central and Eastern Europe at the end of the 1980s and the beginning of the 1990s followed by changes in environmental and agricultural policy, as a possible basis for indicator classification and landscape assessment. Adapted from Mander 0 and Kuuba R (2004) Changing landscapes in Northeastern Europe based on examples from Baltic countries. In: Jongman RHG (ed.) The New Dimensions of the European Landscape, pp.123-134. Dordrecht, The Netherlands: Springer. • Ecosystems have a homeostatic capability that results in the smoothing out and depressing effects of strongly variable inputs. • Match recycling pathways to the rates to ecosystems to reduce the effect of pollution. • Design for pulsing systems wherever possible. • Ecosystems are self designing systems. • Ecosystem processes have characteristic temporal and spatial scales that must be accounted for in environ mental management. • Biodiversity should be championed to maintain an ecosystem's self design capacity. • Ecotones and transition zones are as important to eco systems as membranes are for cells. • Coupling between ecosystems should be utilized wher ever possible. • The components of an ecosystem are interconnected and interrelated and form a network, implying that the direct as well as indirect effects of ecosystem develop ment need to be considered. • An ecosystem has a history of development. • Ecosystems and species are most vulnerable at their geographical edges. • Ecosystems are hierarchical systems and are parts of a larger landscape. • Physical and biological processes are interactive. It is important to know both physical and biological inter actions and to interpret them. • Ecotechnology requires a holistic approach that integrates all interacting parts and processes as much as possible. • Information in ecosystems is stored in structures. The following five recommendations are implicitly embedded in the 19 principles: (1) know the natural and man made ecosystems that make up a landscape and the corresponding ecological properties and processes; (2) use this ecological knowledge in landscape management; (3) develop models and use ecological indicators to enable a thorough overview of the many interacting components, the ecological networks, and the most crucial ecological processes; (4) maintain high biodiversity and a high diver sity pattern of ecosystems, zones, ecotones, corridors, ditches, ecological niches, etc. ; the overloading from man made ecosystems can be reduced and buffered consider ably by planning a landscape with a mosaic of different man made and natural ecosystems; (5) everything is linked to everything else in an ecosystem, and the entire system is more than the sum of its parts. These principles should underlie all ecological management decisions.